Aim To assess the epithelial features of the bulbar conjunctiva using in vivo confocal microscopy in patients with glaucoma undergoing canaloplasty. Methods Thirty consecutive patients with glaucoma were enrolled. Canaloplasty was considered successful if the preoperative intraocular pressure (IOP) was reduced by one-third. The conjunctiva was examined using confocal laser-scanning microscopy 1 week before (baseline) and 12 weeks after surgery. The mean density (MMD, cysts/mm2) and mean area (MMA, μm2) of conjunctival microcysts and IOP were measured. Anterior segment optical coherence tomography was performed to evaluate post-operative trabecular distension and scleral modifications at the surgery site. Results Twelve weeks after surgery, canaloplasty was successful in 23 patients (group 1) but unsuccessful in 7 (group 2). At baseline, IOP was 28.1±2.98 and 28.3±2.81 mm Hg, MMD was 10.61±4.31 and 11.35±5.6 and MMA was 2845.02±411.85 and 2700.56±518.85 in groups 1 and 2, respectively (p>0.05). Twelve weeks after canaloplasty, mean IOP was 13.2±4.48 (p<0.05) and 24.6±3.48 mm Hg in groups 1 and 2, respectively. In group 1, MMD and MMA were 37.86±21.4 and 11997.84±8630.35, respectively, a fourfold increase compared to baseline (p<0.001); no significant differences were found in group 2. Conjunctival bleb was not documented in any case. Conclusions Conjunctival microcysts were evident in all glaucomatous eyes prior to surgery, and tended to increase in density and surface area after successful canaloplasty. These findings indicated enhanced aqueous humour filtration across the sclera and conjunctiva after canaloplasty. Trabeculectomy usually provides successful intraocular pressure (IOP) control, however, several early post-operative complications and long term bleb encapsulation can occur, the latter being the main cause of surgical failure.3 4 In the past few years, different surgical approaches have been proposed for creating alternative AH outflow pathways or restoring physiological outflow routes, thus avoiding subconjunctival aqueous filtration, post-operative complications and the formation of filtering blebs. Canaloplasty is a new non-penetrating, purportedly bleb-less glaucoma surgery that combines the principles of viscocanalostomy with a circumferential distension of Schlemm's canal (SC). A polypropylene 360° tensioning suture is inserted within SC by means of viscodilation, which serves to stretch the inner wall and associated trabecular meshwork to re-establish and facilitate the natural trabeculo-canalicular outflow. Recent studies have shown a significant reduction in IOP and limited surgical complications with canaloplasty compared to trabeculectomy.5–8 The underlying mechanisms behind the reduction in IOP after successful surgery have not been extensively studied, especially possible trans-scleral AH outflow pathway modifications. Some studies based on the analysis of bulbar conjunctiva using in vivo confocal microscopy in patients with glaucoma9 10 suggested that intra-epithelial microcysts, first described within the bleb wall following successful trabeculectomy,11–14 may be considered the hallmark of trans-scleral AH outflow. The aim of our study was to assess and compare conjunctival features, especially microcysts, using in vivo confocal microscopy in patients with glaucoma preoperatively and 12 weeks after canaloplasty. The study included 30 Caucasian patients with primary open angle glaucoma (30 eyes) scheduled for canaloplasty. Patients were enrolled consecutively at the S. Maria della Misercordia Hospital, Udine, Italy and the Ophthalmic Clinic of the University of Chieti-Pescara, Italy. The institutional review board (IRB; the local ethics committee of the University of Chieti-Pescara and Udine) waived the need for IRB approval. Informed consent was obtained from all patients, and the study adhered to the tenets of the Declaration of Helsinki. All surgeries were performed by the same surgeon (PB), as previously described.15 In brief, the conjunctiva and Tenon's capsule were opened at the limbus, the sclera was exposed and superficial and deep scleral flaps were dissected similar to the procedure for viscocanalostomy. The inclusion criteria were: a diagnosis of primary open angle glaucoma with uncontrolled IOP (≥22 mm Hg, mean of three measurements at 09:00 h, 12:00 h and 16:00 h) under maximal tolerated medical therapy and progression of functional damage confirmed on three consecutive 30-2 SITA standard visual fields. Depending on satisfactory postoperative IOP control and surgical success,16 patients were classified into two groups: successful canaloplasty was defined as a one-third reduction in preoperative IOP without anti-glaucoma treatment (group 1) and failed canaloplasty as a reduction of less than one-third in preoperative IOP without therapy (group 2). Exclusion criteria were: angle closure glaucoma, history of ocular trauma, aphakia, previous laser trabeculoplasty or any surgical procedure, uveitic glaucoma, contact lens use, systemic or ocular therapy (other than hypotensive medication) which could interfere with aqueous hydrodynamics, the presence of any other ocular diseases in the last 12 months with the exception of open angle glaucoma, and end stage glaucoma (mean deviation worse than −25 dB). Each eye scheduled for canaloplasty was examined using a digital confocal laser-scanning microscope (HRT II Rostok Cornea Module, Heidelberg Engineering, Heidelberg, Germany) by a single blinded operator. The procedure used to examine the conjunctiva has been previously described.12 Sequential images (300×300 μm in size) derived from automatic scans and manual frames were acquired throughout the entire superior bulbar conjunctiva (consecutively moving the cornea module from the nasal to the temporal region and from the limbus to the upper lid) at the intermediate layer (10–20 μm), in downward gaze. In addition, in four eyes undergoing canaloplasty (two eyes per group), a planar reconstruction of the entire superior conjunctiva was prepared to assess the global distribution of epithelial microcysts. Final maps were obtained by positioning acquired images side by side. The confocal assessment of conjunctiva was performed at baseline (1 week before canaloplasty) and repeated 12 weeks after surgery. Anterior segment optical coherence tomography (AS-OCT) (Visante OCT, Carl Zeiss Meditec, Dublin, California, USA) was performed to evaluate post-canaloplasty trabecular distension and scleral modifications at the site of surgery. Post-operative treatment included preservative-free topical steroids for 8 weeks (dexamethasone 0.15% eye drops four times daily for 2 weeks, followed by thrice, twice and once daily regimens for 2-week periods) and topical antibiotics (ofloxacin 0.3% eye drops four times daily) for 2 weeks. Statistical analysis was performed using SPSS Advanced Statistical 13.0 software (SPSS, Chicago, Illinois, USA). Differences in groups at baseline were evaluated using the Student t test and the ×2 test. The Wilcoxon signed ranks test was performed to compare differences in MMD and MMA at baseline and at the end of the study in both groups. In addition to the raw data, a logarithmic transformation of MMD and MMA values was also applied prior to statistical analysis in order to correct the sample-wide data distribution. The clinical and demographic characteristics at baseline of both groups are reported in table 1. An immediate post-operative AS-OCT of the anterior angle clearly showed distension of the trabecular meshwork in all four quadrants with respect to baseline (figure 1A,B). 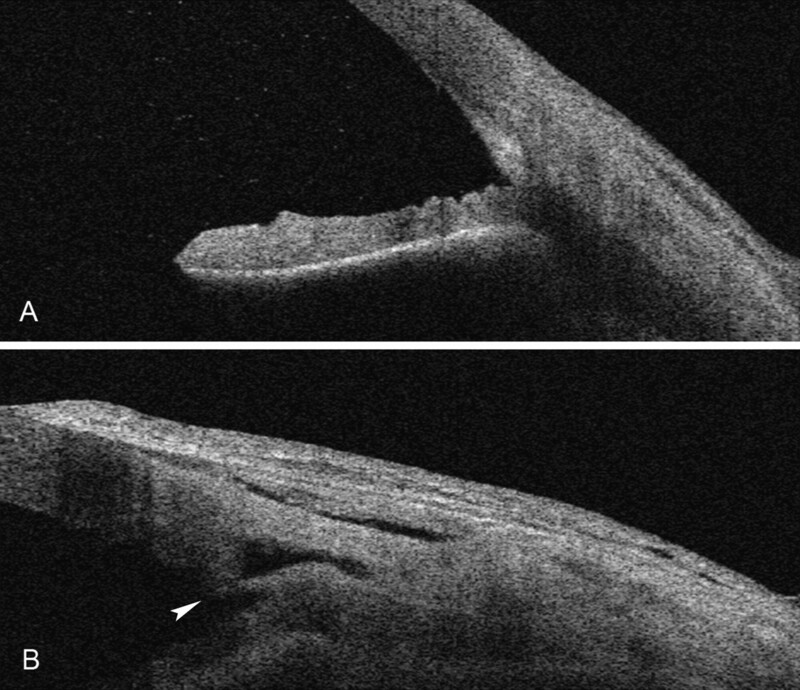 Anterior segment optical coherence tomogram at baseline (A) and immediately after canaloplasty (B), showing adequate trabecular distension (arrowhead). Twelve weeks after canaloplasty, surgery was successful in 23 patients (group 1) and unsuccessful in seven cases (group 2). None of the patients showed a clinically visible conjunctival bleb and no significant intra- or post-operative complications occurred. Conjunctival microcysts found in all patients before surgery were optically clear structures surrounded by a hyper-reflective wall, and were round or oval-shaped and differently sized, occasionally containing amorphous material and/or round cells (presumably inflammatory cells). 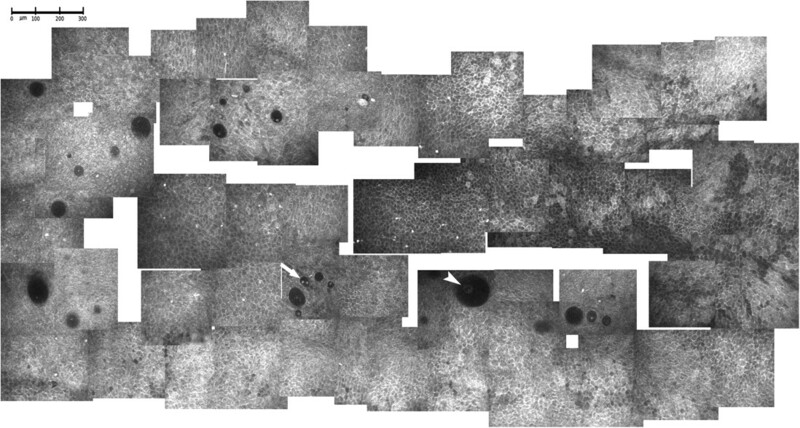 A planar reconstruction of the entire superior bulbar conjunctiva showed scattered microcysts with no signs of clustering (figure 2). Planar reconstruction of the superior bulbar conjunctiva in a glaucomatous eye before canaloplasty. 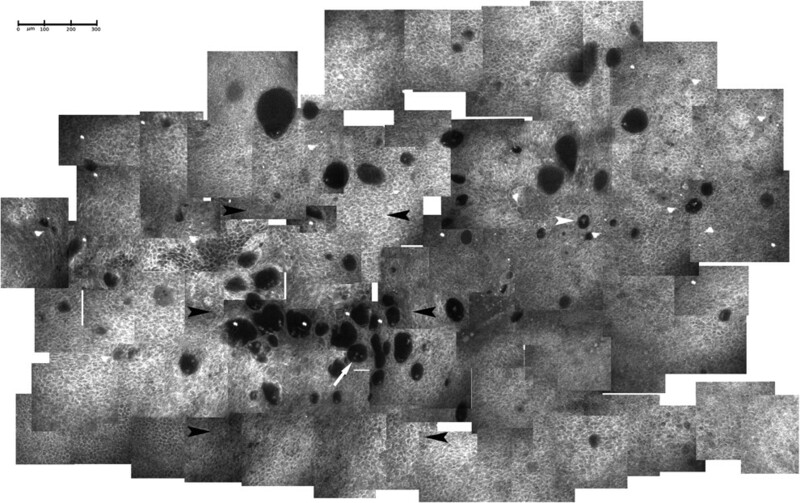 Microcysts had well defined walls, with some containing amorphous material (arrowhead) and/or round and hyper-reflective elements (arrow), probably mono-nuclear inflammatory cells. The microcysts appeared to be homogeneously distributed, with no signs of clustering. Baseline MMD and MMA were 10.61±4.31 and 2845.02±411.85 and 11.35±5.6 and 2700.56±518.85, in groups 1 and 2, respectively (p>0.05). Twelve weeks after canaloplasty, the mean IOP was 13.2±4.48 mm Hg (p<0.05) (IOP reduction of 52.9%) and 24.6±3.48 mm Hg (p>0.05) without therapy in groups 1 and 2, respectively. In the successful group, MMD and MMA were statistically different and approximately four times greater compared to baseline (p<0.001), with values of 37.86±21.4 and 11997.84±8630.35, respectively. Confocal assessment of the superior bulbar conjunctiva showed microcysts having different shapes and sizes (surrounded by a low reflective wall, with some filled with an amorphous material and/or presumed inflammatory cells). There were more of these microcysts after canaloplasty, and they were clustered and larger especially at the site of surgery, and also clearly increased in number posteriorly (figure 3). Planar reconstruction of the superior conjunctiva 12 weeks after canaloplasty. Microcysts were more frequently filled with amorphous material (white arrowhead) and/or round and hyper-reflective elements (arrow), had a less uniform distribution, and were commonly oval-shaped, thin walled, greater in number, larger in size and clustered at the site of surgery. Black arrowheads indicate the site of surgery. In group 2, the features, the pattern of distribution and the microcyst parameters did not significantly change with respect to baseline. In particular, the MMD and MMA values were 12.24±8.1 and 3134.13±2702.87 (p>0.05), respectively. AS-OCT in both groups showed appropriate suture placement and trabecular distension with no signs of bleb formation; in both successful and failed cases a thinned superficial scleral flap and a well defined intra-scleral lake (slightly thinner and larger in group 1) were evident at the site of surgery (figures 4 and 5, respectively). Additionally, an intra-scleral hypoechoic space posterior to the scleral lake was evident in several eyes following successful canaloplasty (figure 4). Anterior segment optical coherence tomogram 12 weeks after successful canaloplasty. A thin superficial scleral flap (white arrowheads) overlies a large and well defined intra-scleral lake (arrow); no signs of conjunctival filtering bleb formation were evident at the site of surgery. An intra-scleral hypoechoic space is evident posteriorly to the scleral lake (black arrowhead). The asterisk indicates the site of suture placement. Anterior segment optical coherence tomogram 12 weeks after failed canaloplasty. A thin superficial scleral flap (white arrowhead) overlies a well defined intra-scleral lake (arrow); no signs of conjunctival filtering bleb formation were evident at the site of surgery. The asterisk indicates the site of suture placement. The exact mechanisms of AH outflow and IOP reduction after canaloplasty have not been widely reported and are still not completely understood. The main aim of canaloplasty is the anatomical restoration of the trabeculo-canalicular system to facilitate AH outflow through the physiological pathway. Canaloplasty, however, can also theoretically exploit other outflow pathways such as progressive AH percolation through the trabeculo-descemetic window, via the intra-scleral lake, and through the superficial scleral flap towards the conjunctiva. Grieshaber et al19–21 have suggested the presence of trabeculo-canalicular outflow based on studies involving injection of diluted fluoresceine through the microcatheter during cannulation of the SC, showing the presence of dye in the episcleral venous system in 70% of treated eyes. Our results may indicate possible enhancement of AH outflow across the sclera based on the increase in the density and area of epithelial microcysts at the superior bulbar conjunctiva 3 months after canaloplasty without evidence of a filtering bleb. Microcysts were originally described within the bleb wall epithelium following successful trabeculectomy11–14 and were considered as hallmarks of trans-conjunctival AH filtration. 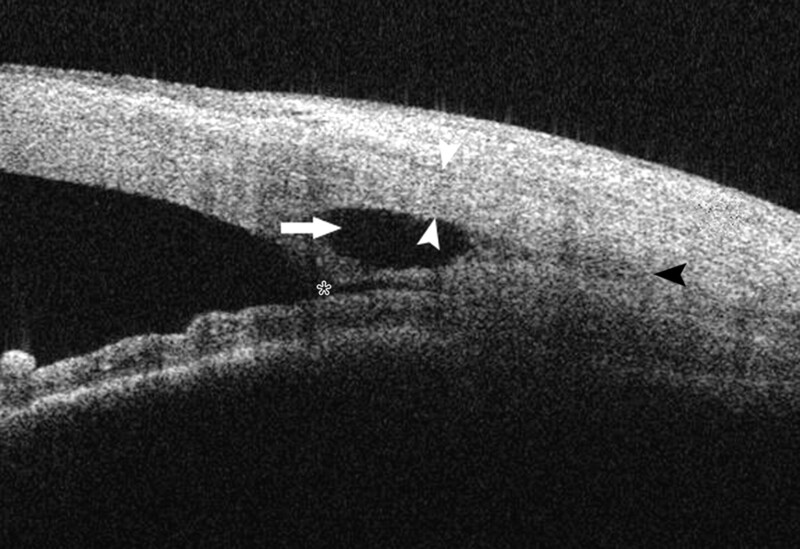 Subsequently, microcysts were also reported in untreated ocular hypertension and in patients with glaucoma under medical therapy before surgery,9 10 thus supporting the hypothesis that microcysts indicate activation of an alternative pathway of AH drainage (ie, trans-scleral routes) in conditions of increased IOP. In our study, microcysts were evident in all patients, and were significantly increased 12 weeks after surgery only in patients with functioning canaloplasty. Pre-operative MMD and MMA values showed a fourfold increase after canaloplasty, suggesting AH filtration enhancement through the sclera and conjunctiva. In particular, the post-surgical planar reconstruction of the entire superior bulbar conjunctiva showed that microcyst density and area mainly increased at the site of surgery, thus indicating that trans-scleral percolation mostly occurred in this area. These changes may result from the reduced scleral thickness at the site of surgery after the removal of the deep scleral flap, allowing AH to easily cross the sclera in increased amounts. Recent evidence seems to support our hypothesis21: the additional IOP reduction after goniopuncture, in the absence of a filtering bleb, could be explained by enhanced AH trans-scleral outflow at the site of surgery. However, possible activation of other trans-scleral pathways has to be considered since microcysts clearly also increased posteriorly to the site of surgery, although they were more scattered. This hypothesis seems further supported by the presence of the hypoechoic space posterior to the scleral lake in several successful cases (figure 4). Nevertheless, we cannot categorically exclude the possibility that the increased AH outflow at the site of surgery could also result from leakage around the scleral flap along incision lines, even though a filtering bleb was not documented in any of the cases. However, in light of the water-tight closure of the scleral flap, it seems unlikely that AH can percolate through incision lines 3 months after surgery. Conversely, in failed cases the density and surface areas of conjunctival microcysts did not increase either at the site of surgery or posteriorly, which also further supports our hypothesis. Moreover, hypoechoic intra-scleral spaces posterior to the scleral lake were not observed in any of the failed cases (figure 5). These findings suggest that, although restoration of the trabeculo-canalicular outflow may be the main mechanism in successful canaloplasty, trans-scleral AH outflow enhancement may also play a significant role in lowering overall post-surgical IOP. Inadequate suture tensioning has been postulated as one cause of surgery failure21: too little tension may not provide an adequate reduction in outflow resistance, while too much tension may close off the inter-trabecular space, thus increasing outflow resistance. Based on our results, reduced post-surgical trans-scleral AH filtration can contribute to unsatisfactory IOP reduction. Although we did not perform measurements or statistical analysis, the absence of trans-scleral AH filtration in failed canaloplasty may be due to a thick superficial scleral flap, and/or a thick trabeculo-descemetic window, and/or a small scleral lake (features generally more common in group 2) or the presence of an episcleral fibrotic membrane over the surgical site. Therefore, it would be interesting to see if the application of intra-operative anti-metabolites improves the success of the procedure or increases microcyst area. Regarding the safety of canaloplasty, no significant intra- or post-operative complications were observed in our study, which contrasts with the results of Lewis et al5 who reported peri-operative complications in 16% of cases. Lewis et al also reported complete success in 60% of patients with a 3-month post-operative IOP of 16.1±4.7 mm Hg; in comparison, our study results showed complete success at 3 months in 70% of patients with a post-operative IOP of 13.2±4.48 mm Hg. These discrepancies could be explained by the fact that the former study was based on multicentre data from a larger cohort of 94 surgical patients compared to 30 patients in our study. Moreover, our results may have been positively influenced by demographic differences between the cohorts (white patients in our study) or by the experience of the surgeon, who had performed over 140 procedures in the past few years. Further studies are needed to address some issues that remain unanswered. First, based on our data, it is not possible to quantitatively determine what percentage of the final decrease in IOP was independently due to the restored trabeculo-canalicular outflow and to the overall trans-scleral outflow. Likewise, it is not possible to exactly quantify the impact of possible inadequate suture tensioning and the absence of a trans-scleral outflow increase in final surgical failures. In addition, there may be other unknown outflow pathways influenced by canaloplasty that have a lowering effect on IOP. Second, the role of topical therapy in the pathogenesis of pre-operative microcysts is still debated. However, the presence and persistence of microcysts due to antiglaucoma drugs or preservatives has not been supported in the literature, especially since they have also been reported in untreated ocular hypertension.9 Additionally, the real significance of conjunctival microcysts needs to be addressed, since these structures have also been described in healthy eyes and in some non-glaucomatous ocular conditions. In two different studies,22 23 microcysts were occasionally reported in the tarsal and bulbar conjunctiva of healthy young subjects. Zhu et al24 later analysed the bulbar conjunctiva in different age groups of healthy subjects (from 14±4.1 to 72.5±6.6 years) and reported epithelial microcysts in all groups, increasing in number with age. The authors speculated that microcysts, in these cases, may correspond to degenerated goblet cells or normal intermediate products of cellular development and maturation. Furthermore, conjunctival microcysts were occasionally reported in some non-glaucomatous ocular conditions such as pterygium25 and Sjogren syndrome26 and in contact lens wearers.27 Here microcysts were probably related to degenerative processes occurring within the conjunctival epithelium, when disturbances in cellular maturation created debris in cystic spaces. However, in these studies the authors did not provide any information about the IOP of the enrolled subjects. Therefore, we hypothesise that epithelial microcysts may have more than one connotation, since in the presence of ocular hydrodynamic impairment they may indicate trans-scleral outflow enhancement, while in other conditions they may result from epithelial disruption. Nevertheless, we cannot rule out that microcysts, in both healthy eyes and non-glaucomatous conditions, could be a sign of physiological trans-scleral aqueous percolation, which normally occurs as the final phase of outflow via the uveo-scleral route. In conclusion, our study suggests that canaloplasty, in addition to restoring the trabeculo-canalicular system, causes increased trans-scleral AH outflow by enhancing and activating pre-existing and/or new routes.
. The effects of filtering operations. Klein Monatsbl Augenheilkd 1977;170:10.
. Histology and mechanism of filtering operations. Am J Ophthalmol 1959;47:16–33.
. Prevention of early postoperative hypotony by partial ligation of silicone tube in Ahmed glaucoma valve implantation. J Glaucoma 2001;110:466–9.
. Needle revision of filtering blebs. J Glaucoma 2008;17:594–600.
. Canaloplasty: circumferential viscodilation and tensioning of Schlemm's canal using a flexible microcatheter for the treatment of open-angle glaucoma in adults: interim clinical study analysis. J Cataract Refract Surg 2007;33:1217–26.
. Circumferential viscodilation and tensioning of Schlemm canal (canaloplasty) with temporal clear corneal phacoemulsification cataract surgery for open-angle glaucoma and visually significant cataract: one-year results. J Cataract Refract Surg 2008;34:433–40.
. Canaloplasty: circumferential viscodilation and tensioning of Schlemm canal using a flexible microcatheter for the treatment of open-angle glaucoma in adults: two-year interim clinical study results. J Cataract Refract Surg 2009;35:814–24.
. Canaloplasty for primary open-angle glaucoma: long-term outcome. Br J Ophthalmol 2010;94:1478–82.
. Conjunctival modifications in ocular hypertension and primary open angle glaucoma: an in vivo confocal microscopy study. Invest Ophthalmol Vis Sci 2008;49:3042–8.
. Conjunctival characteristics in primary open angle glaucoma and modifications induced by trabeculectomy with mitomycin C: an in vivo confocal microscopy study. Br J Ophthalmol 2009;93:1204–9.
. In vivo confocal microscopy study of blebs after filtering surgery. Ophthalmology 2005;112:1979–86.
. In vivo confocal microscopy of filtering blebs after trabeculectomy. Arch Ophthalmol 2006;124:1095–103.
. In Vivo confocal microscopy of failing and functioning filtering blebs: results and clinical correlations. J Glaucoma 2006;15:552–8.
. Filtering bleb Functionality: a clinical, anterior segment optical coherence tomography and in vivo confocal microscopy study. J Glaucoma 2008;17:308–17.
. Visco-canalostomy: A New Surgical Technique for Open Angle Glaucoma. Spain: Inst Barraquer, 1995;25:229–32.
. Factors associated with success in first-time trabeculectomy for patients at low risk of failure with chronic open-angle glaucoma. Ophthalmology 2004;111:97–103.
. Canaloplasty in one eye compared with viscocanalostomy in the contralateral eye in patients with bilateral open-angle glaucoma. J Glaucoma. Published Online First: 26 January 2011. In press.
. Are there filtering blebs after canaloplasty? J Glaucoma. Published Online First: 26 January 2011. In press.
. Clinical Evaluation of the aqueous outflow system in primary open-angle glaucoma for canaloplasty. Invest Ophthalmol Vis Sci 2010;51:1498–504.
. Channelography: imaging of the aqueous outflow pathway with flexible microcatheter and fluorescein in canaloplasty. Klin Monbl Augenheilkd 2009;226:245–8.
. Circumferential viscocanalostomy and suture canal distension (canaloplasty) for whites with open-angle glaucoma. J Glaucoma 2010;20:298–302.
. In vivo confocal microscopy of normal conjunctiva and conjunctivitis. Cornea 2006;25:781–8.
. In vivo confocal microscopy of the bulbar conjunctiva. Clin Exp Ophthalmol 2009;37:335–44.
. Age-related changes of human conjunctiva on in vivo confocal microscopy. Br J Ophthalmol 2010;94:1448–53.
. Conjunctiva—pathological findings. In: Guthoff RF, Baudouin C, Stave J. Atlas of Confocal Laser Scanning In-vivo Microscopy in Ophthalmology. Berlin, Germany: Springer, 2006:134.
. Conjunctival in vivo confocal scanning laser microscopy in patients with Sjögren syndrome. Invest Ophthalmol Vis Sci 2010;51:144–50.
. Confocal microscopy of the bulbar conjunctiva in contact lens wear. Cornea 2010;29:43–52.